I've been flying the Matalan flag for a while on this blog - from their amazing homeware to the super affordable clothes (remember this gorgeous jumpsuit? ), I always find something that I love in there. So I was pretty excited to get asked to collaborate with them for this post, to show you some of what they have in the Matalan Holiday Shop. I had £50 to play with and I can't believe how many things I managed to get for that amount. Ripped Denim Shorts - If you don't want your bum cheeks on show, shopping for denim shorts can be a hard task these days. I already have a pair of acid wash shorts from Matalan so I knew I was going to like this light denim ripped pair too. They're the perfect cut - just the right amount of high waisted-ness(?) and zero chance of bum flashing. Something that I love about Matalan, is that the sizing is consistent. If you know you're a size 8 in their shorts, you can buy a size 8 in all the shorts and they'll all fit the same. This makes a huge difference when shopping on line, and I just wish that more places were the same! Woven Printed Shorts - These shorts are exactly the sort of thing I like to wear on holiday. Super comfortable, loose-fitting and with a really nice print that means I can just throw on a plain cami or cropped top and be on my way. I love the print on these and guess what, they're only £8. How amazing is that? Strapless Playsuit - I always take a couple of play suits like these on holiday with me, so I've got something to throw on when I'm on my way back from the beach or the pool. I love the print on this and it's a really nice, light cotton material with a bit that ties in around the waist to give it some shape. White Denim Shorts - I've always loved the look of white skinny jeans or white shorts - even if you're wearing them with a plain t-shirt, they always make it look like you've made that little bit of an extra effort. This pair are, again, the perfect fit and most importantly, they're not in the slightest bit see through. Suede Fringe Sandals - Suede and fringing is everywhere this summer and these sandals caught my eye straight away. These are perfect for holiday but they'd also look really good with a pair of black or white skinny jeans too. I picked the black pair, but these also come in a tan shade (here) which are gorgeous too. I'm so happy with everything that I've chosen - it's not often that I can buy this many things, like all of it and it all fits perfectly! 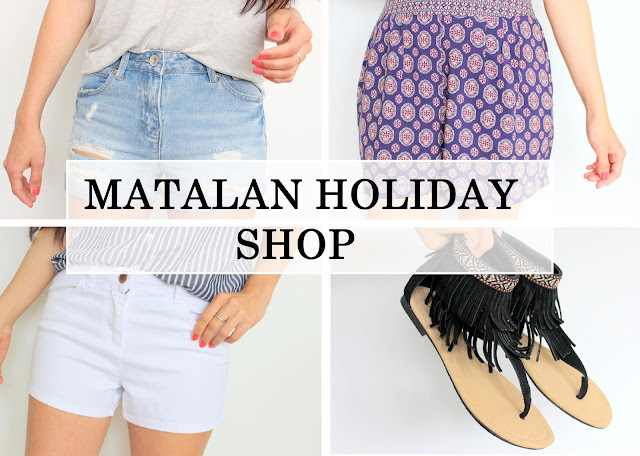 I'd definitely recommend checking out the Matalan Holiday Shop to see what you can find! Which item did you like the most? Do you ever shop in Matalan? *all items provided by Matalan, and as always, all opinions are my own. 15 comments on "HAUL | Matalan Holiday Shop"
I love the woven shorts! I think I need to get to Matalan before my holiday, and before there summer stock is put away to make way for Autumn clothes. Love the woven print shorts, I can't believe how much you got for £50! Love these printed shorts! I picked up a couple of pairs of summer printed trousers from matalan recently. They are so comfy and affordable!